People believe the misconception that sugary candies are the worst things for your teeth. While candy can be damaging, there are other foods that are terrible for your teeth as well. Think You May Have Cavities? Schedule An Appointment Here! What Food Can Damage My Teeth? Here is a quick list of the top five most deceivingly bad foods for your teeth. Peanut butter may seem harmless and healthy, however, the sticky texture adheres to your teeth and promotes a build-up of plaque-causing bacteria. Another seemingly harmless food items are gummy vitamins, a go-to for those who are unable to swallow pills, however, they are not the best for your teeth. The sticky concoction glues itself to your teeth, preventing your saliva from accessing that part of your tooth. Another damaging food that people often overlook are citrus fruits like pineapple, lemons, grapefruit and limes, ALL which are highly acidic. These fruits cause immediate damage to your teeth by turning your saliva acidic. Adults who consume alcohol are also at risk for tooth decay, due to the common effect of dry mouth from consuming drinks high in alcohol. When your mouth is dry, your saliva is unable to do its job. Lastly, old fashioned white bread is yet another notorious cause of cavities. Once the bread is in your mouth, bacteria immediately begin to breakdown the food into particles which can become trapped inside the pockets and crevices between your teeth and gums. If your saliva can’t reach the space between the food and your tooth, bacteria begin the process of breaking down the enamel causing cavities. When food becomes trapped and your saliva is unable to wash away the particles, bacteria flourishes, breaking down the sugars into acid. 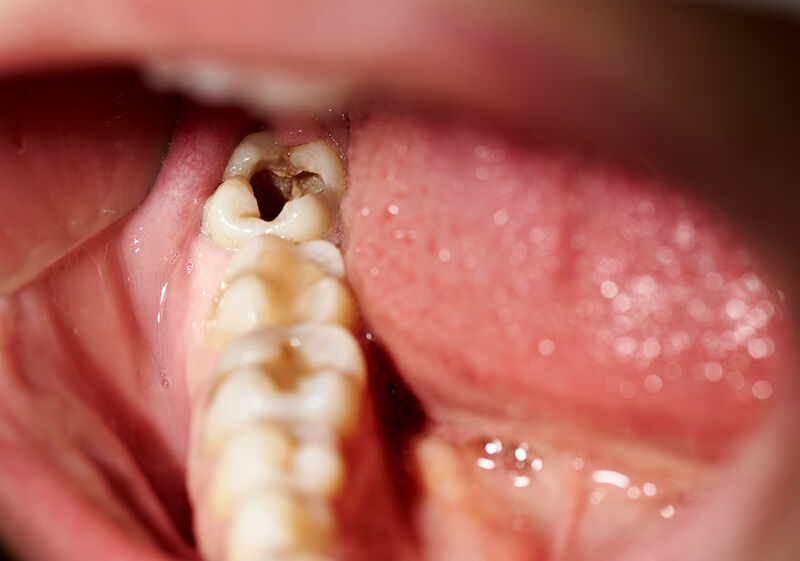 If this process continues, you eventually lose enough tooth structure and begin to develop holes in your teeth. You may not even be aware that a cavity is forming. A cavity will appear as a dark spot on a tooth, sometimes you can see a hole on top of the tooth or feel it with your tongue. Pain when one bites down or mild to sharp pain when eating or drinking hot, sweet or cold drinks. If you find one of these holes, you likely have a cavity. That’s why it’s important to have regular dental checkups and cleanings, even when you’re symptom free. When Should See a Dentist? Preventative dentistry is the first line in protecting your pearly whites from further tooth decay and loss. When the tooth enamel erodes away, there’s nothing that can be done to fully restore it. If you notice discoloration, sharp pains, increased sensitivity or holes on your teeth, it’s important to call and a schedule an appointment with your family dentist for cavity fillings. A dentist can fill your cavities, and prevent further damage and save your tooth.